When it comes to learning how to save money there is frequently a miscommunication that happens. There are those that want to spend less money and others who are looking for information on how to put more money into their savings account. Write down everything you spend for a month (ALL OF IT!!) – It seems like a big task, but getting a full understanding of where you money is being spent is key to knowing how to spend it better. Put together a budget – If you aren’t putting together a plan for your money then you are not going to save. That extra money will find a place to go if you don’t tell it where to go. Set Long Term Goals – Whether it is fully funding an emergency fund or getting your retirement to where you need it, having a long term goal will make the budget feel a lot more important. Make it automatic – As many types of saving that you can make automatic, the better off you will be. Look for areas to spend less and put more into savings – When you get your budget fully set up you are going to notice some areas where you have been overspending. Make a real effort to get those areas under control and put more in your savings account each month. Create Barriers – Areas where you keep overspending or where it is easy to overspend can be neutralized by using cash envelopes. Just take the money out that you are allowed to spend and only spend that cash. Put your money in a high interest savings account – If you are going to be putting money into savings you should be getting the best interest rates you can. This way your savings grows a little. Cash back programs – There are online cash back rebate sites that pay you a percentage back for using their link to visit your favorite online retailers. My favorite is TopCashBack, but we cover several in our review of the different sites. Keep track of the growth – Doing a monthly or quarterly audit of your savings allows you to see where you are and refocus your long-term goals. Celebrate – Whenever you hit a milestone or one of your goals, take a small amount of money and have a little celebration. Then get on hitting the next goal. Buy stuff on sale – This goes hand in hand with planning ahead. Once you recognize that there is an expense coming you can be on the lookout for a really good sale. Buy stuff on Clearance – I love clearance items because the prices are usually better than what I can get them on sale. Make instead of buying – Whether it is gifts, clothing, or firewood, you can save money if you have the time to make things instead of buying them. Go home and think about it – If you are about to make a purchase you were not planning on making, put the item down, go home and then think about whether you really need it. If you are shopping online then give yourself 48 hours before making any non-planned purchases. Buy other peoples stuff – Whether it is craigslist or a yard sale you can get really good stuff that is only slightly used. We have saved a fortune on kids stuff by focusing on gently used items from our local area. The average American family spends over $300 every month in the grocery store. Groceries are a huge part of our monthly expenses, but there are a few ways that we can keep the grocery store from breaking the bank. Always Check for Free Samples – There are tons of free samples that you can receive in the mail. My top site right now is FreeFlys.com, but there are a bunch of ways to get these samples. I washed my hair for over a year with free samples from shampoo companies. Make a list – one of the easiest ways to save money is to make a grocery list before you go to the store. Most shoppers tend to buy a lot of food that they don’t need and eventually goes to waste. Instead of throwing that money in the trash, make a list of foods you need and stick to the list. Eat before you go – if you’re anything like me, it’s hard to resist some yummy looking snack food while you’re grocery shopping. It’s a lot easier to turn down those impulsive purchases if you aren’t hungry while you’re shopping. Grab a snack before you go to the grocery store or take one with you. Your stomach will be full, and so will your wallet. Plan around the sales – when you sit down to plan out your meals for the week, the sales paper should be your guide. Is chicken on sale this week? Then a lot of your meals should include chicken. You can plan your whole week around which proteins and veggies are on sale. Shop at discounts stores – if you’re looking for another easy way to save money on your rising grocery bill, discount stores are a great way to do that. You’ll do your grocery shopping like normal, but you’ll notice the hit to your wallet is a lot softer. Two of the best discount grocery stores in the country are Aldi and Wal-Mart. Coupons – thanks to several different reality shows, coupons have become a hot new way of saving money in the grocery store line. If you’ve never couponed before, you can be overwhelming to start, but it’s not as hard as it seems. Luckily for you, I’ve created a guide on how to coupon. If you’re looking to start slow, you can get some coupons in the mail. Generic – more than likely, whatever grocery store you go to has a generic version of just about everything on your list. Sure, some items won’t taste EXACTLY the same or work quite as well, but 99% of generic items are identical to the brand name versions. Buy local – buying your fruits and vegetables from local farmers and stores accomplishes two things, you help grow your local economy, and you keep more money in your wallet. This is especially true you you are buying organic. Buy in bulk – going to stores that sell in bulk is a great way to save money and cut down the number of grocery store trips you have to take every month. Honestly, it’s not the best way to save money, but a little is better than nothing. Stores like Costco and Sam’s Clubs require a membership fee, but it pays for itself if you utilize it. One area where bulk shopping really shines is in the meat department. Personally, I buy my meats from Zaycon Fresh (a.k.a. Zaycon Foods), which allows me to get great meat at a low cost. Don’t shop for convenience – it’s nice to be able to eat your breakfast on-the-go or have your snacks in already divided portions, but that convenience is more expensive. Mail order meals – speaking of convenience, nothing is more convenient than having meals that are ready to cook delivered to your doorstep. Services like Hello Fresh and Blue Apron mail you everything you need to make a fresh and healthy meal in your own kitchen. Sounds expensive, right? Where you save money with meal kit delivery services is in the individual ingredients. If you were to try these meals on your own you would have to buy larger amounts of all the ingredients than what you need. These meals come with the portions you need to make the meal, so you save on ingredients you may never use again. Eat Less Meat – Now don’t cut meat out all together, because that is crazy talk. You can, however, reduce the amount of meat you use in recipes or eat one meal a week that does not include meat. Meat can be pretty expensive on a per ounce basis so make sure you are checking the deals or getting the tasty but more affordable cuts. Go cheaper on hygiene – most hygiene products contain the exact same ingredients. So take a look at what makes your favorite hygiene products work and find a cheap alternative that has the same active ingredients. Another option that my family is trying is making our own soaps and deodorant in bulk and saving on a per ounce basis. Shaving Needs – Razors and shaving cream are a few of the most over priced items on your shopping list. For cheap razors, either go with coupons and discounts or look at one of the mail order services that charges dramatically lower prices. Make more and freeze – If you are making a dish that can be easily frozen, make several batches and freeze all the ones you do not need for that night. Then on days when you are tired and might be tempted to eat out, all the prep work is done and you can just pop it in the oven. There are some days when you just don’t feel like cooking. It’s been a hard day at work, you have no idea what food you have at home, and the thought of cleaning up after makes you want to pull your hair out. So, instead of cooking at home, you decide to go out to eat, but that doesn’t mean you have to break the bank just to get a nice meal out. Restaurant.com – this website is very easy to use and can easily save you 50% on your meal at your favorite local restaurants. All you do is go to the website and you can buy $25 certificates for $10, easy as that! Some of them may have restrictions on how much you have to spend and the nights that it is valid, but it’s a great way to enjoy local restaurants and save some money. As an bonus, after you sign up for an account you can get e-mails that will have discount codes to save you, even more money. Rewards clubs – just about every restaurant chain has some type of loyalty club that you can join for free. All of the rewards clubs vary by the chain, but a lot of them give you free entrees, appetizers, or drinks after your reach a certain limit. You might not save a ton of money every time, but getting a free meal every once in a while is worth a few junk emails you might get. Happy birthday! – one of the best things about surviving another year is all of the free meals that you can get on your birthday and the weeks around it. There are HUNDREDS of different restaurants that offer free stuff on or near your birthday. If you’re like me, your birthday can be all year around, and you can enjoy the savings on more than just one day. There’s an app for that – that smartphone in your pocket could help you do more than just waste time, it can also save you money on eating out. Some restaurants are creating their own apps that not only let you order before you get there but also deliver special promotions. Several apps can help you enjoy a great meal out without leaving you broke at the end of the night. Have kids? – If you have a kid (or several), you know that eating out can quickly rack up a huge bill. If you’re looking to take the whole family out for dinner, you could easily pay $50 or more. Instead, look for places that have a ‘kids eat free’ night. Normally your child can get a free entrée and maybe a free drink (sometimes you’re required to buy the drink). Early bird – depending on what time you go out to eat could have a significant impact on your bill. Earlier in the day when restaurants are less busy, you can take advantage of early bird prices or special lunch only deals. H20 – going with water instead of soda, tea, or an alcoholic beverage isn’t only healthy for your body, but it’s better for your bank account as well. Asking for water instead of the other options can save you several dollars per a person. For a family of 4, you’re looking at around $10 saved. Discount cards – these discount cards not only save you money but what you pay to get them always goes towards a good cause like a high school sports program or booster club. These cards normally cost around $20, but you can almost always get your money back in the discounts. It could be anything to a free drink, free appetizer, or a buy one get one free deal. The best part is, the cards are valid for the whole year. Sharing is caring – restaurant portions are too big for just about any one person to eat. Instead of both you and your spouse or friend getting an entrée, only get one dish and share it. You can both get a side or an appetizer, but you’ll notice your bill is drastically lower and you’re still full. Coffee – I know I just struck fear into your heart if you are a coffee drinker, but you don’t have to stop drinking coffee just stay away from the expensive coffee drinks. If you have to have them then check out places other than Starbucks that serves similar drinks for much less. If you are a Starbucksophile then at least check out my post on how to save money at Starbucks, and look into some sort of 12 step group. Invite friends over – Instead of heading to a restaurant, have some friends over where everyone brings something to eat. You get to try new foods and enjoy the fun of having friends. As a side benefit, this is also great motivation for cleaning and picking up your house. Avoid convenience stores – we have an awesome chain of gas stations called QuikTrip. While they have great prices on some things, others are not so good. Avoid the items at convenience stores that you can get for much less at the grocery store. For some families in America, they are spending as much as 25% of their income on related transportation costs. Yikes! Fortunately, there are several things that you can do to lower your costs but still get where you need to go. A well-oiled machine – if you’re looking to keep your transportation costs low, you’re going to need to get your hands dirty…. Or at least have someone do it. Keeping your car in tip-top condition can save you money. Making sure the tires are properly inflated helps you gas mileage. Making sure you get your oil changed regularly keeps your car from suddenly breaking down and draining your bank account. Fuel Rewards Programs – There are different programs out there to give you a discount on gasoline for doing your regular shopping. My favorite is the Shell Fuel Rewards Network, but there are a ton of ways to get free gas or at least get a discount each time..
Gas rewards credit card – the credit card you use to pay for your gas could actually save you money. There are a lot of credit cards out there that can save you 1% to 5% on your fill-ups, but some cards are better than others. Carpool – this one is pretty simple. If you live close to some of your coworkers or friends that work nearby, start a car pool. You and your friends can trade off driving duties and cut your gas spending in half, plus you’ll have someone to talk to while you’re stuck in traffic! Plan ahead – don’t wait until you have 5 miles until empty to get gas. At that point, you have to stop at whatever gas station you come to. If you plan your fill ups ahead of time, you can make sure you get the best price available. There are apps like GasBuddy.com that can show you the lowest gas prices near you. Public Transportation – If you need in a city where public transportation is available, take advantage of it! Sure, it might not be as convenient, but it can reduce you transportation spending drastically. Check you car insurance rates – if you’ve had the same car insurance policy for several years, it could be time to switch carriers and save money. You can always receive quotes from several different companies, and in will only take you a few minutes. Evaluate your coverage – similar to switching auto insurance companies, you should also make sure you aren’t paying for coverage you don’t need. There are thousands of drivers paying for collision and comprehensive coverage that isn’t worth it. Raise your deductible – if your car insurance deductible is $250 or $500, you can save a good chunk of money every month by raising it to $1,000. Your monthly premiums will be much lower, but make sure that you have enough money set aside to pay the deductible just in case. Slow down – Driving too fast can hurt your gas mileage. The faster you go, the less fuel-efficient your car is going to be. The optimal speed is 45 mph, this is where you’ll get the best gas mileage. Clean your air filter – Air filters are one of the easiest changes to make on a car. That is why the service stations LOVE to change it for you. Do this one yourself and you will save a bunch on the purchase and it helps with fuel economy. We do stuff in our finances that make more vulnerable to spending more money. Here are a few ways to get your expenses down. Go Automatic – There are many times when you can get a discount for setting up automatic payments. A big one is student loans. People can save $60-$100 per year with their loans this way. Set up your bill pay – Most banks now offer bill pay online. You can set up where the payments need to go, and once the bill comes in, you fill out the amount and they send the check. You save money on postage and keep the entity you are paying away from anything automatic. Refinance to a lower rate – if you have an older mortgage at a much higher rate than is currently available, then refinance for a much lower interest rate and cut your payments way down. Many times you can keep the exact same or reduce the number of years and still end up better off on the monthly payment side. Check each of your bills – You never know when someone who is billing you will make a mistake or if you accidentally signed up for a service you didn’t want. So make sure to check your bills each month to make sure they are correct and that you understand them. Check your checking – Make sure you are not getting charged for your checking account. There are way too many free ones available to be paying for checking. Ask for better rates on revolving credit – Credit card companies are notorious for raising rates on people. If you have high rates then ask for a lower one or surf you balance to a low APR credit card. Home is where the heart is…. But it’s also where we spend a large portion of our money. Your house is one of your most valuable assets but can quickly drain your wallet as well. Look for leaks – having poor fitting windows or warped doors could be costing you hundreds of dollars every year by lost efficiency. These little leaks could be forcing your air conditioning unit to work overtime. Other leaks – Water is a big problem for the interior of a house. Make sure you aren’t letting any of that nasty dihydrogen monoxide into your interior. How’s your insulation? – if you live in an older home, this could be a serious money waster. Make sure the insulation in the walls is up to par, or if you have any at all. Kill the lights – aside from helping the environment, turning off the lights will also help your bank account. Cut the cord – one of the newest and most popular ways to save money in the home is to cut your cable bill. Cable packages have gotten as high as $100 or more every month. You’re paying for hundreds of channels that you never watch. Instead of paying the cable company a small fortune every month, switch to online streaming services like Netflix and Hulu. Upgrade the thermostat – technology has changed the way that we do everything, including heat and cool our homes. With the new thermostats on the market, you can program it to either go up or down at certain points during the day. You don’t have to waste money when you aren’t there. Go Smaller – Focusing on housing that fits your needs instead of fulfilling every possible dream will cut down drastically on your mortgage, heating costs, and time cleaning. Go LED – LED light bulbs are getting more and more affordable and they last between 10 and 20 years. These are the light bulbs that will drastically cut your expenses and they don’t do weird things like the CFLs. Program your heating and cooling – before we had kids my wife and I bot worked full time. I purchased a programmable thermostat so that the heating and cooling would automatically adjust to us not being there most of the day. Get Shaded – whether you plant trees in your yard or you use insulating interior window shades, you can save a bunch by keeping the sun out of your house during the summer. Replace or Add windows – If you have older single pane windows you can replace them with double pane windows or you can install storm windows. Either way you should see a 25%-50% energy efficiency bump than single panes. Low Flow Everything – There is a whole Seinfeld episode about low flow shower heads, but there are now low flow toilets and you can add spray nozzles to your hoses to eliminate wasted water. Change the Filters – Check your filter for how often you need to change them. A dirty filter doesn’t let as much air through and makes your HVAC unit work harder to heat or cool your home. Go Cold – Anywhere you can use cold water will reduce the amount you use your water heater. Laundry and washing your hands would be the two easiest. Water Heater Temp – The last estimate I have seen is that 13% of your energy usage is going to heat the water you use. So turn down your water heater to 120 degrees. This still gets the water plenty hot, keeps kids from scalding themselves, and saves you a bundle. Cover Your Water Heater – You can help that water heater keep warm with a water heater insulating blanket. This can really help with keeping the water warm in the winter. Use Your Dishwasher – I know this seems counter intuitive, but you if you are filling up your dishwasher then running it, it will use much less water than you filling up the sink or running the faucet while you wash. One thing you don’t want to do is use the heat dry, which spends extra energy when you could just wait 20 minutes. Get a Smart Power Strip – Many electronics continue to use power after you turn them off or we power down one device but forget to turn off everything associated with that device. A good example is your desktop computer. You power down the computer but leave on the printer and monitor. This uses electricity and wastes money. A smart power strip detects when a primary device is turned off and then kills the power to everything else. So when your TV is turned off the dvd player, game console and other devices power down too. Clean out the closets – We all tend to accumulate things over time. Find things you haven’t used in a long time and sort them into keep, donate, and sell piles. You also may find stuff that can be repurposed and then you won’t need to spend on whatever those items can replace. Buy quality appliances – Do you research when making any major appliance purchase. A better washing machine or dish washer may cost you a little more, but if it is more energy efficient and lasts longer than the cheaper version then you will save money in the long run. All work and no play makes Jack a dull boy, right? Every once in a while all of us need to go out and have a little fun. Used is better – just about everything you buy for entertainment can be bought used. With 99% of the things you buy, it being used isn’t going to make a difference. With sites like Amazon and eBay, buying used has never been easier. Libraries – your local library and enjoy the millions of books and DVDs that you can check out for free. A library card won’t cost you anything, and you’ll have access to hour upon hours of free entertainment. Some libraries have adopted online sites that allow you download a book to your phone, tablet, or e-reader, so you don’t even have to go to the library. Catch up with Mother Nature – more than likely you live near a place where you can go for a walk, hike, jog, or picnic. The outdoors offers plenty of free entertainment. If you’re looking for a nearby hiking trail, alltrails.com lets you search trails by your city. Go Early/Go Late – depending on the time of day you go, you could save some serious money on your entertainment. For example, if you’re trying to see the latest blockbuster hit, catching a matinee can save you 50% on your movie ticket. Community Events – every city holds community events that you can enjoy for free or a low price. Anything from plays in a park, free movie events, parades, or festivals. You can enjoy tons of free entertainment and get to know some of your neighbors. Look for a calendar of events to make sure you don’t miss any of the fun. Board Games – board games are a lost art that has diminished thanks to technology and television. One of the best ways to reconnect with your friends and family is to sit down with a nice board game. You probably have several sitting around that you haven’t played in forever. Minor league sports – sure, going to see professional sports are fun, but you also have to pay a professional price tag. Nobody wants that. There are hundreds of minor league sports teams across the nation, most tickets will only cost you around $15 or less. Don’t buy tickets online – there are a lot of things that buying online will save you money, but tickets normally aren’t one of them. With most websites, you’ll pay several extra and fees that can double the price of your tickets. Instead, call the venue and ask to buy the tickets over the phone. It’s just as easy, and you won’t have to pay the extra fees. Cut the Cord – Cable television rates have gotten out of hand. You can reduce cable bill by as much as half by going internet only. Check out my guide to cutting the cord for a more detailed run down of how to get your television bill under control. Your health is one of the most important things. But staying healthy doesn’t have to cost an arm and a leg. You can be in perfect physical condition without being in poor financial situation. Generic – much like groceries, switching to generic drugs can save you hundreds of dollars every year. If you’re worried that generic versions don’t perform as well, have no fear, these drugs are required to treat the same condition with the same effectiveness as the brand name medications. You’ve got mail – similar to switching to generic, getting your prescriptions through the mail instead of going to the pharmacy can save you hundreds of dollars every year. These mail order prescriptions usually come in three-month supplies, which means you won’t have to worry about having it filled as often. Exercise – getting enough exercise can do wonders for your body. Regular physical activity can slim down your waist, strengthen your heart, and prevent sickness. You don’t have to have an expensive monthly gym fee to stay active. Watch What You Eat – similar to getting enough exercise, what you eat could have a significant effect on your health, which then impacts how much you spend on your health. Eating a lot of bad food can lead to obesity or poor nourishment, which then typically leads to more medical bills. Samples – because there are always new medicines and treatments entering the market, doctors and pharmacies give out samples to customers. Ask your doctor for any samples of your prescriptions or alternatives. It may only be a couple of weeks worth of medications, but it could save you a lot of money in the long run. Check the Bill – if you have been to the hospital recently, or have any surgery, you know that it can get expensive, really fast. But the accounts that send you the bills are human and make mistakes just like everyone else. Always double and triple check your medical bills when you get them. If you don’t understand why you were charged for something, call and ask. You can even have your bill itemized so you can break it down easier. Ask for a Discount – if you want to save some money on your healthcare costs, why not just ask? If you’ve been with your doctor or care provider for a long time, ask them for any discounts or price cuts they can offer. A lot of people are surprised by the discounts they get. Kick the habits – we all have our bad habits, but some of them are bad on our wallet as well. Things like smoking, frequent alcohol consumption, or drug use is not only bad for our health but also bad on our back accounts. Quick Pay Discounts – Because of the number of people that draw out their payments over months or years, hospitals will frequently offer quick pay discounts. One more reason to have your emergency fund ready. Shop Your Procedure – If you are getting a procedure done that is not urgent, you can shop different providers to see who offers the best price. Use an HSA or FSA – If your employer plan offers it, use the health savings account or flexible spending account. This will get your medical care paid for before taxes are taken out on your income. Go with the Natural Remedies – Some of that old timey medicine does actually work. If you can find a natural remedy and don’t need to go into the doctor you can save big bucks. 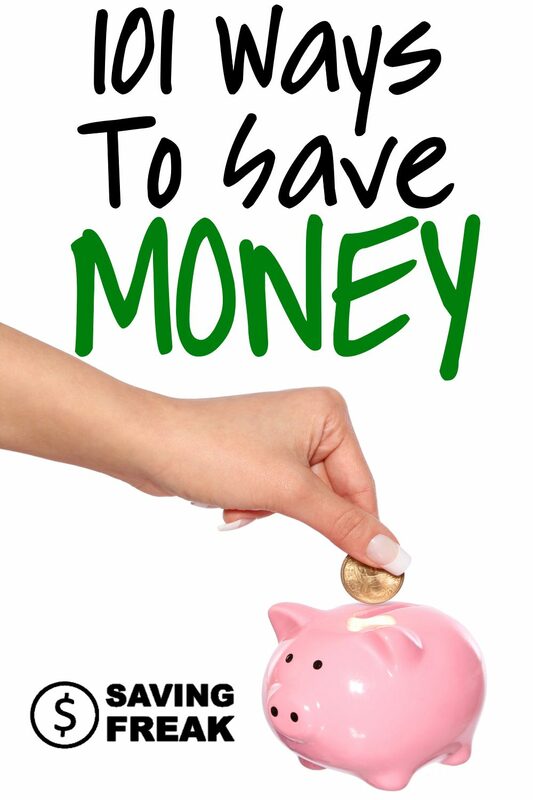 There are tons of ways to save money and I am sure I have missed a bunch. The important thing is, once you get into this frugal mindset, you can make this a part of your life. Instead of worrying about financing and payments, you can worry about how cheap you can get everything. There are only few things in this world that feels better than finding a good deal. What are some ideas you have for saving money? Leave them in the comments for all of us to benefit.